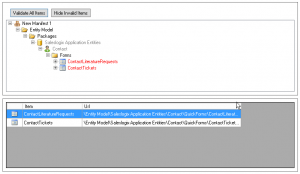 Infor CRM Web Error- The bundle could not be created because this manifest has invalid items. I was recently working in the 8.3.0 Infor CRM Application Architect (I also tested in the latest release, 8.3.04). The upper case X is not an exact case match to the actual image resource file in the OOTB system, which is “plus_16x16”. If you try to bundle one of these OOTB forms, the manifest shows it is an invalid item but it does not tell you what the problem is. This resource validation of the quick forms should be case in-sensitive. Also, while it is nice the forms are being validated in such a way, Infor really needs to provide details as to what is being identified on the quick form as being invalid instead of just saying it is invalid. I only found this issue when looking for the case of “plus_16X16”. I have no idea if there are other OOTB forms defining other images where the resource image name case does not match. This only started happening in 8.3. Previous systems did not show these quick forms as invalid in the web manifest. I have reported this to Infor. Thanks, saved me a lot of time trying to deploy a production bundle. Note that you can edit the capital “X” in the resource definition in the control properties on the affected form, in order to get the bundle to save properly.